Pololu sells the encoders in sets of 5 ($0.69 for a single disk). While Pololu offers free shipping inside the USA, it is rather expensive to get the encoder disks outside the USA, and I have not found any other supplier. 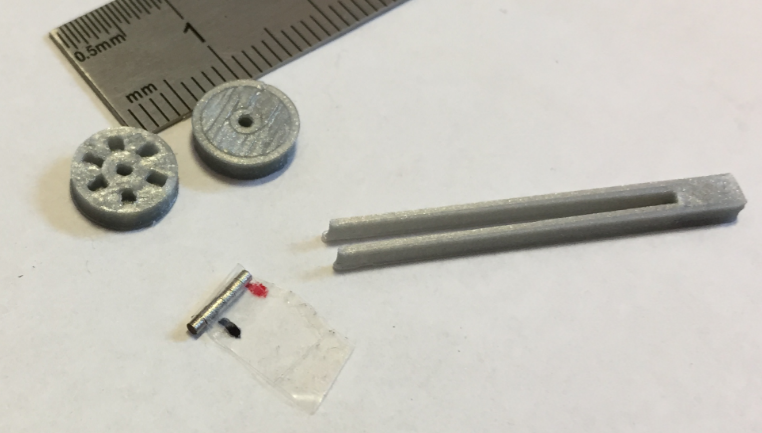 In that case, here is a low-cost way (assuming you have a 3D printer available), making it possible to build magnetic encoder disks for less than $0.30 each. That way placed and glued 6 magnets into each disk. 💡 Depending on the sensitivity of the magnetic sensors, it might be necessary to use 12 magnets (2 in series). For this I have put on GitHub another 3D model for more magnets. 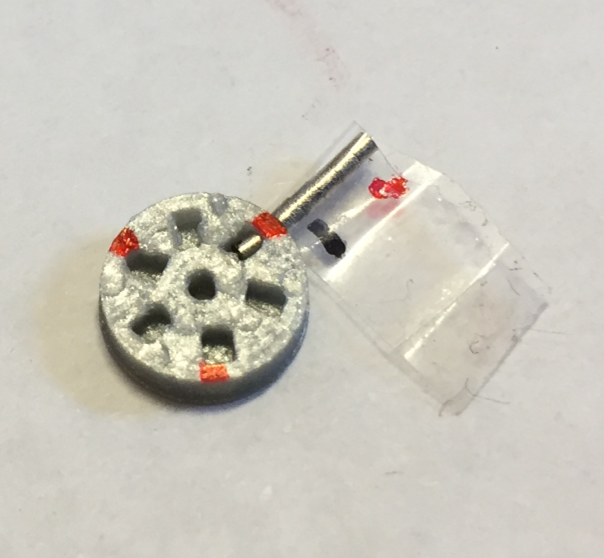 In case you have a 3D printer available and need a custom magnetic encoder disk for you robotics project, you can print your own encoder disk. Sure it is easier to buy the encoders from Pololu, but always good to know that I can build them myself too. 💡 if you know another source for these magnetic encoder disks other than from Pololu, please let me know. 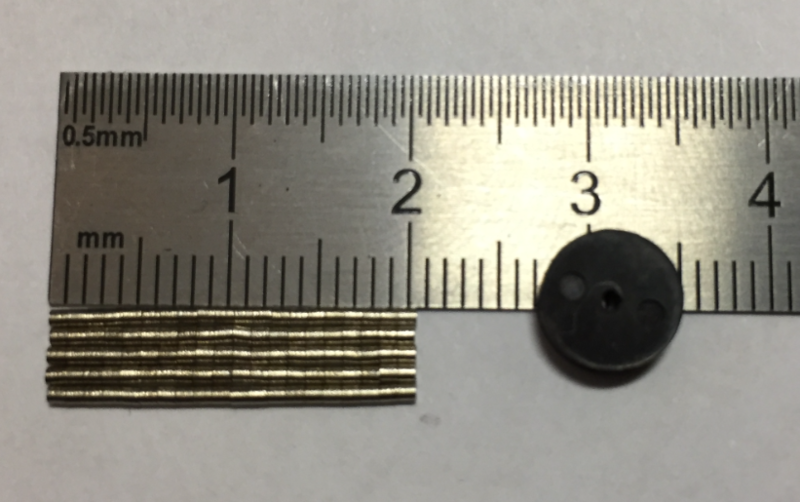 This entry was posted in 3D Printing, Building, Embedded, Pololu, Robots, Sumo, Tips & Tricks, Tutorial and tagged 3D Printing, Building, DAC Sumo Robot, Encoder, Encoder Disk, Magnets, neodymium, Quadrature Encoder, technology, Tips&Tricks by Erich Styger. Bookmark the permalink. Nice job and good additions to the sumo. Thanks! Still it is kind of tricky to place these small magnets into the disk. I had to to place one, glue it, wait, then the next one, etc. Otherwise one magnet could take out the other from its socket. Maybe I find an easier way? 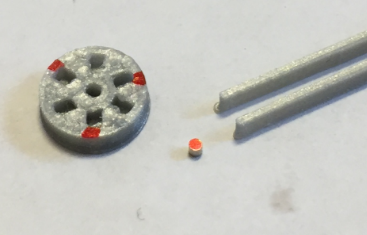 If your 3d printer is accurate enough, perhaps you could make the cavities for the magnets be press-fit, and/or include a small overhang so the magnets get snapped into place and stay put long enough for the glue to set. Yes, I tried to get close to that. There are always some small tolerances, and if the cavity is too small, enlarging it is tricky. That’s why I kept it 0.1 mm larger. What comes to my mind is to approach it with a disk and holes from the ring side: as the holes are around 1mm, there is no problem with overhang, and I could enlarge them with a driller if needed. I place the plastic part onto a steel ruler, then the magnet snaps downwards (in a different project involving plastic parts (cast resin) and magnets that have to be glued in with the correct orientation without one magnet pulling out the other). 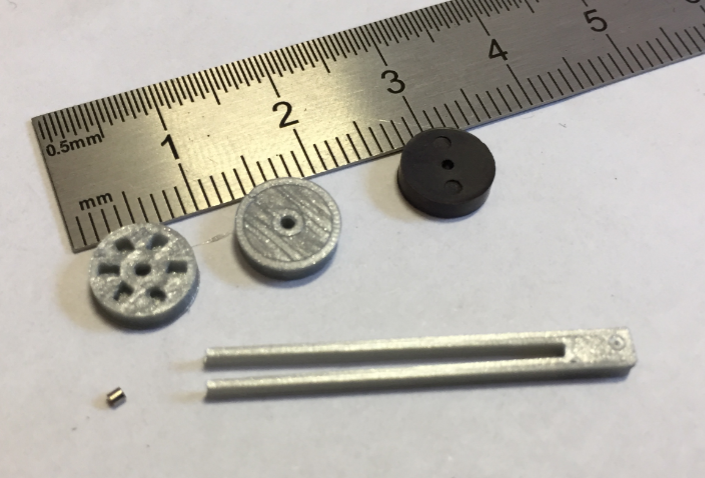 I have 8 mm diameter and 2 mm thick disc magnets. To place them, I use an 8 mm plastic tube and a metal pin inside. The metal pin is good to pick up the part and hold it while placing it into the hole (8 mm deep). Then I pull out the metal pin while holding down the magnet with the plastic tube. Together with the steel ruler this works quite well. Allen keys (Inbusschluessel) work well for the metal pin since they are more or less round, have a flat end, and are available in different sizes. I also use a steel ruler to park the magnets after marking one pole. That way I can pick them up one by one. First I had them stacked like you do but then the marker paint transferred from one to another while stacked (my workflow is mark all — glue all, not mark — glue — mark — glue). On the steel ruler they don’t move. If they stick too much to the ruler, some tape on the ruler helps (I have a layer of tape on the back of the ruler anyway, it makes it less slippery). If you plan on making many of the discs then perhaps a jig around the disc with (stronger?) 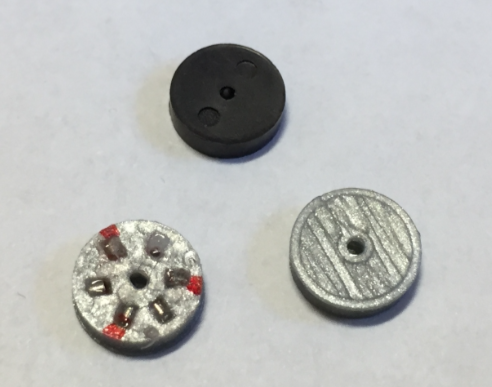 magnets is an option so that the small magnets go into the disc with the correct orientation automatically. 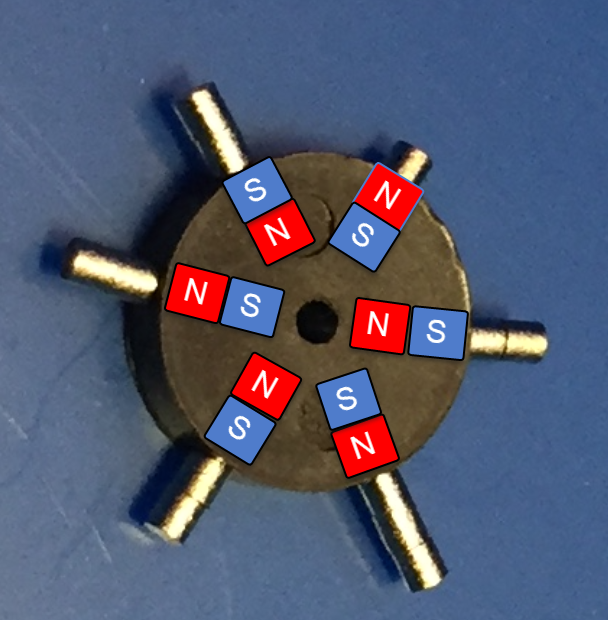 Similar to the single magnet in the photo “Placed magnet into disc”, but all around and fixed in place. Superglue and activator spray hold the magnet in place quickly. great tips and suggestions, thank you! I already found out that the metal ruler helps a lot to park the magnets. Great tip about the plastic tube, that indeep helps a lot too! yes, staying below the Curie temperature is important. My hairdryer is not that hot, however (it would be a hair-cutter then 🙂 ). PLA becomes soft around 60-70 degrees Celsius, so there is some room. 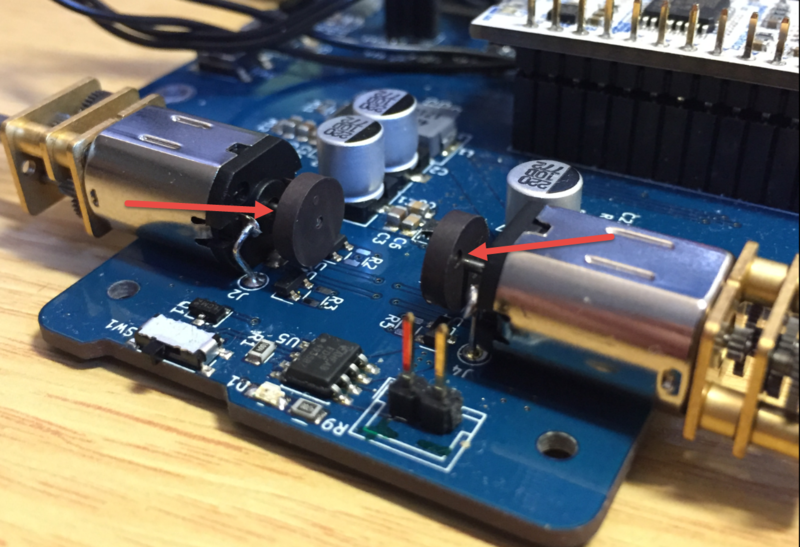 I meant to warm up the plastic, not heating up the magnet and then with the magnet the plastic (as it is shown in the Hackaday article). On the other hand, I only have put one ball bearing into the plastic, not 6 small magnets so close to each other. Your other idea with the holes coming in from the side has another advantage that you can keep all magnets stuck together when inserting them, then shearing it off when the frontmost magnet is in the hole. That would make the insertion of magnets very quick and easy, not much marking necessary. And it’s harder for one magnet to “jump out” and stick to the neighbour when the holes are radial. Nice idea Erich, this is how 3D printers should be used. And not for iPhone cases and fidget spinners. I found few encoders on ebay: https://www.ebay.ie/itm/Magnetic-Encoder-Pair-Kit-for-Micro-Metal-Gearmotors-12-CPR-2-7-18V/201448434785?hash=item2ee7432c61:g:cuAAAOSwcN1aVgJr but they are not cheap (but it’s the disc with the sensor) and the look suspisly similar to pololu stock. thanks for that link to eBay: yes, these are the same endcoder kits as from Pololu (I have them too). Cool. I ended up doing pretty much the same things to some cheap gear motors I ordered. They originally had 11 pole pairs or something crazy like that, and the hall switches would only trigger if they were dragging on the wheel, and still plenty of missed steps. ah, you used square magnets which are easier to handle than the cylinder ones I used. What is the size of your disk (diameter) and the size of the magnets? 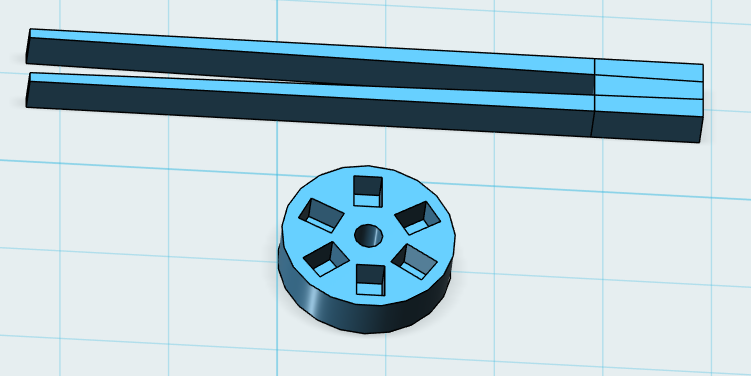 It’s actually a necessary fix for those motors (cheap worm geared motors from the usual suspects online). They have the encoder PCB and wheel on them to begin with, but they’re poorly matched. The wheel has 22 poles, and they’re either too weak, or too close together to properly trigger the hall switches. I had a microcontroller running them through an H bridge jogging back and forth, and the drift was visible within a few seconds. 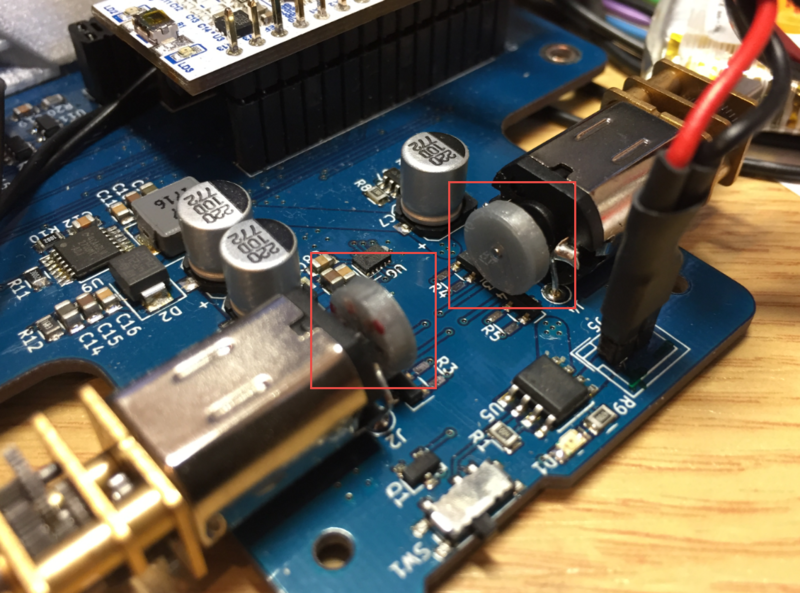 There was also the issue that there’s no insulation on the back of the PCB and the pins on the connector were long enough to touch the motor can, but after both of those fixes it actually seems pretty decent. I think I have seen these motor encoders in some places/shops. Good usage of these hard drive magnets! Pretty interesting idea! My mind instantly jumped to a page I came across on ‘Single Track Grey Code Encoders’ (http://techref.massmind.org/techref/io/sensor/pos/enc/greycodes.htm) and it made me wonder if that could work for your project. Instead of LED’s, you’d use Hall effect sensors and replace the slots with magnets. What do you think? Pololu has them in store, and they work pretty good. But they need some signal conditioning and are subject of infrared light noise (e.g. sun light). So hall sensors are my preferred solution: easier to use (on the PCB) and more reliable plus the hall IC has the hysteresis built-in. Maybe these are too big for your particular use case, but I wanted to share the idea anyways.